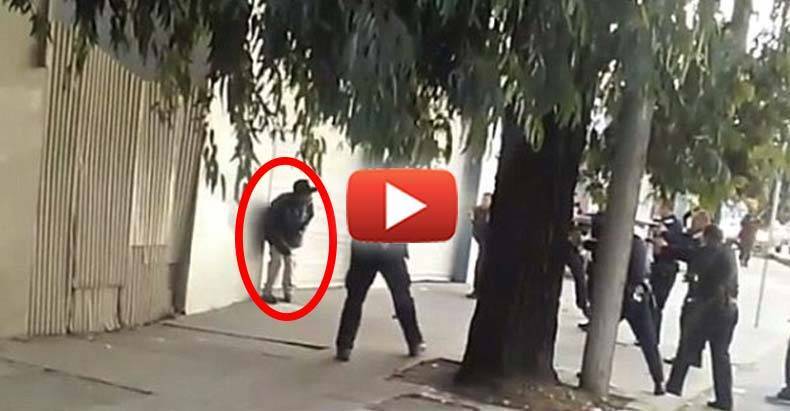 San Francisco, CA — A horrific cellphone video was uploaded to Instagram yesterday that shows at least ten cops publicly execute a man as he attempted to walk away from them while holding a knife. The scene was eerily similar to that of Laquan McDonald, only this time instead of one cop (Jason Van Dyke) opening fire, seemingly all of them did. Police were apparently looking for a man suspected of stabbing someone and he fit the description. Police Chief Gregory Suhr confirmed the man was killed after the shooting in Bayview at around 5 pm on Wednesday. As the short video begins, the man appears confused and out of it, but he is not charging at any of the multiple officers standing around him with their guns drawn. In fact, the man appears to be holding his stomach and in distress, perhaps from a bean bag shot moments prior. But he then stands up straight and tries to walk off. At this moment, the woman filming is in so much anguish that she drops down the phone before a fury of gunfire can be heard being unleashed on the man. Below is the disturbing footage. Only in America do police so quickly and easily escalate to deadly force before exhausting all other measures. The US would do well to study policing in other countries. The lack of deadly force is so common by police in European countries that it’s not only been documented multiple times, but it’s been caught on film multiple times. It is high time this country looks closely at the way it trains its police force.